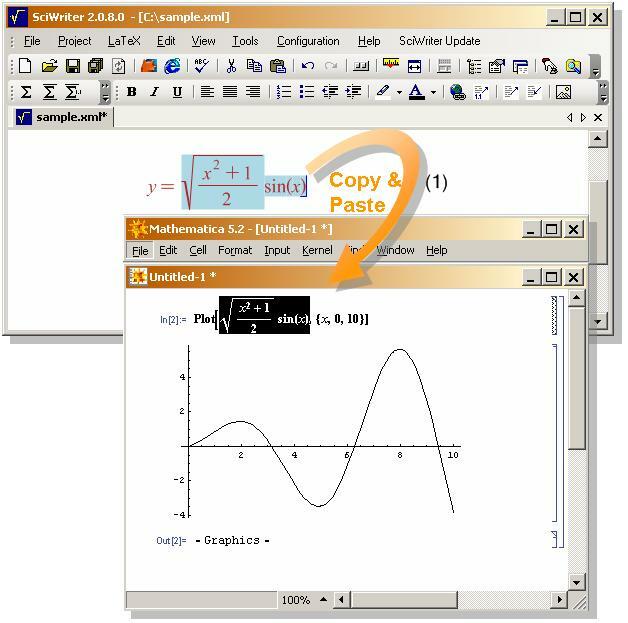 SciWriter is an XML-based scientific editor that completely integrates writing mathematics and text in the same environment. The native document format is a subset of XHTML 1.1 and MathML 2.0 Presentation Markup. Print Publishing: A SciWriter document can be exported to LaTeX and be published as PDF, Postscript or DVI. Web Publishing: SciWriter documents can be published on the web as XHTML+MathML or as HTML with equations as images. Qweas is providing links to SciWriter 3.0.3.0 as a courtesy, and makes no representations regarding SciWriter or any other applications or any information related thereto. Any questions, complaints or claims regarding this application SciWriter 3.0.3.0 must be directed to the appropriate software vendor. You may click the publisher link of SciWriter on the top of this page to get more details about the vendor.